A Product Recall has been announced by OSRAM for certain PAR46, PAR56 & PAR64 lamps. The recalled lamps are sealed beam Tungsten Halogen quartz and Incandescent lamps consisting of a parabolic glass reflector & front lens. The lens diameter is 6” (PAR46), 7” (PAR56) or 8” (PAR64) in diameter. The words “Made in China” are printed on a black & white label affixed to both the single box and the case package. The lamps defined here also say Made in China on the back of the lamp reflector as shown in the image below. The part numbers listed below do not appear on the lamps themselves, but appear on the box labels. 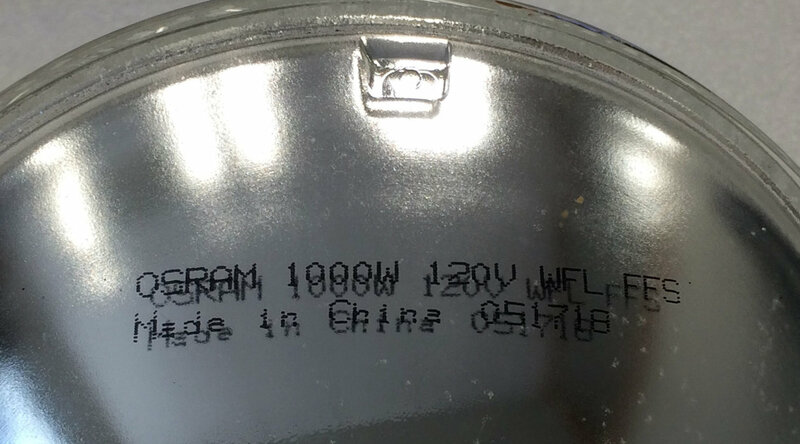 It should be noted that only lamps with these part #s that additionally say “Made in China” are part of this recall.